The Gold Line as it made its way toward DLTA on Saturday. It was very standing room only. The line to buy TAP cards at the Gold Line’s Sierra Madre Villa Station in Pasadena on Saturday morning. Photos by Steve Hymon/Metro. Good coverage above of the massive crowds that used Metro (or tried to) to reach the Women’s March in DTLA on Saturday. The original plan was to run buses and trains on a modified Saturday schedule but as more and more and then some more people showed up, the lines grew and grew and then grew some more as Metro went into catch-up mode and began adding trains to the Red, Blue and Gold Lines. I saw it firsthand. 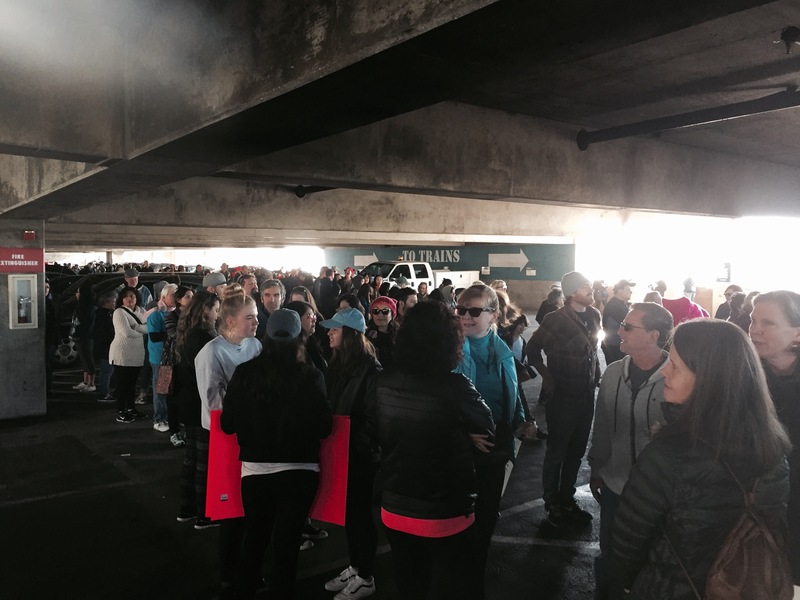 I went to the Sierra Madre Villa Station in eastern Pasadena a little after 9 a.m. At that point, there were still some parking spots on the roof and an extremely long line at the TAP vending machines snaking through the fourth floor of the garage. After one train came packed to the gills, I got on the next Azusa-bound train and doubled back at Duarte, which was pretty much at full capacity by the time we reached Lake Station in Pasadena — with another 11 or so miles to go to DTLA. My own three cents: I thought the return trips home went better and, all in all, the agency adjusted as well as it could to the crowds. Still, many trains were running at full capacity, getting out of Pershing Square Station was difficult because there was no room left on the street, there were very long lines to purchase TAP cards and there was even a false rumor circulated via social media in the a.m. that fares were free (at some stations fares were waived to help deal with lines and crowd control). We put up “thank you for your patience” posts on Twitter and FB on Saturday evening and you can see some of the reaction from riders (click below). For the most part, people were good sports as the crowd — which organizers claim was as large as 750,000 — vastly exceeded their original projections. In hindsight, perhaps the size of the crowd and the demand on the Metro system could have been deduced ahead of time from the social media buzz about the march beforehand. As for ridership numbers, the agency hasn’t released anything yet. One definite lesson learned: for these of big events, we need to really push hard to remind folks to get TAP cards ahead of time, either from the TAP machines at stations or the locations around L.A. County that sell TAP. Once someone has a TAP card, they can be reloaded online and used to ride the trains; you just need to load online at least an hour before riding. Your thoughts on how things went on Saturday would be helpful. Comment please. Metro staff are asking the agency’s Board of Directors to authorize increasing the budget for the project by $199 million, bringing the total budget for the Connector to $1.75 billion. That’s 28 percent higher than the original budget of $1.36 billion. The major problem? Costly utility relocations, according to Metro officials. The Connector is being built in parts of DTLA that have many decades of utilities underground, not all of which have an official record. The Board will consider the budget increase at their regular meeting on Thursday. The primary staff report is below; click here for text of the report and links to the attachments. You can also listen/watch a discussion at the item at the Board’s Construction Committee last Thursday. Click here and then click on item 49 to go straight to that discussion. One of the Measure M projects is a bus rapid transit line (BRT) between North Hollywood and Pasadena that would build upon the NoHo to Pasadena Express bus that began operations in 2016. That bus mostly uses the 134 freeway to access business centers in Pas, Glendale, Burbank and then the Red Line and Orange Line station in NoHo. Walk Eagle Rock makes the argument that such a line should travel along Colorado Boulevard through Eagle Rock — Colorado is the home to many restaurants, businesses and is near many homes — instead of the 134 freeway, which sits high above the community with no real access. Unlike Glendale and Burbank, Eagle Rock isn’t a major commercial center, but it’s obviously a popular neighborhood that, like many others in L.A., has seen a revival in recent years. Is there any estimate for when ridership numbers for Saturday will be released? Hey Andrew — Not sure when we’ll have them. Metro way to go in servicing the needs of trains for rush times. The expo line was not requiring fares Saturday a.m. I was at the expo line station at Culver City around 7:30 a.m. Saturday morning and there were repeated announcements over the loudspeaker that due to the long lines to purchase fares, no fare was needed. I heard it multiple times, but only after I reached the platform and I had tapped on my way up. Yes, fares were definitely suspended at some stations. The challenge for us is that folks went on social media saying there were no fares across the system — and that was incorrect. As a result, some folks got some freebies while others paid. Obviously not ideal, but if it helped move everyone along, then I hope everyone understands. By my estimation, the math does not support 750,000 people at the rally, unless hundreds of thousands of people walked, biked, or taxied/ridesourced in. People were reporting that parking was available within a mile of the march, and while transit was full, each three car light rail train could only carry 600 people (200 people in a car would be a crush load of a train car with only 68 or so seats), and each six car subway train could carry at most 1,000 (166 people per car of a with 61 seats). With six rail lines coming in (both Gold branches, Blue, Expo, Red, and Purple) and eight trains an hour maximum (the Gold, Red, and Purple did closer to five trains an hour due to delays handling these crush loads, but keeping it simple) – that’s about 35,200 people per hour total which could be carried by Metro Rail. This is why I don’t find the 750,000 number credible – it was probably closer to 500,000, and that’s counting people who left because it was too crowded before lunch, and those who arrived in the afternoon because that’s the only time they could fit on the trains. Hmm. Had a very slow Saturday at the Printing Museum. Then again, given the number of people who were either involved in the march, or hung over from either too much celebration or too much mourning the day before, or avoiding Los Angeles County completely, it’s kind of understandable. I hope that when Metro does sit down and figures out the lessons learned from this weekend, it will also figure out why it ignored or missed the overwhelming signs that this event was going to be huge, and figures out what its maximum capacity really is in terms of train-lengths and highest frequencies. Thanks for the story, Steve. Agree with Erik’s comment. Tried to take the Orange Line in but too few buses were running too far apart. Finally gave up as full buses went by and decided to drive to Koreatown from Van Nuys, parked, and took the Purple Line in. Fortunately, it was a good crowd of people and returning helped several people with the inevitable confusion of the Purple and Red lines (why the heck are the signs on the sides of the cars so small and hard to read!). Didn’t see any staff to help people with their TAP card purchases (was happy to already have mine). With the Orange Line, which I use several days a week, it is anyone’s guess how accurate the arrival times are under the best of conditions. Metro really needed to get more buses on the route or make announcements. This was an amazing event, and I hope Metro draws meaningful lessons from it. Regarding pre-purchase of TAP cards: Between my husband and I, we attempted to pre-purchase our TAP cards at 5 separate Ralph’s locations in Hollywood, Burbank, and Glendale, all of which were sold out in the days prior to the march. Could there be a way to ensure that your outside TAP vendor locations are reasonably well-stocked with cards prior to large events in the future? Among the other, more routine large events held in Los Angeles, the social media buzz for the April 15th Tax Day march has already begun, and I’d love for this to be as smooth a process for new Metro riders as possible! 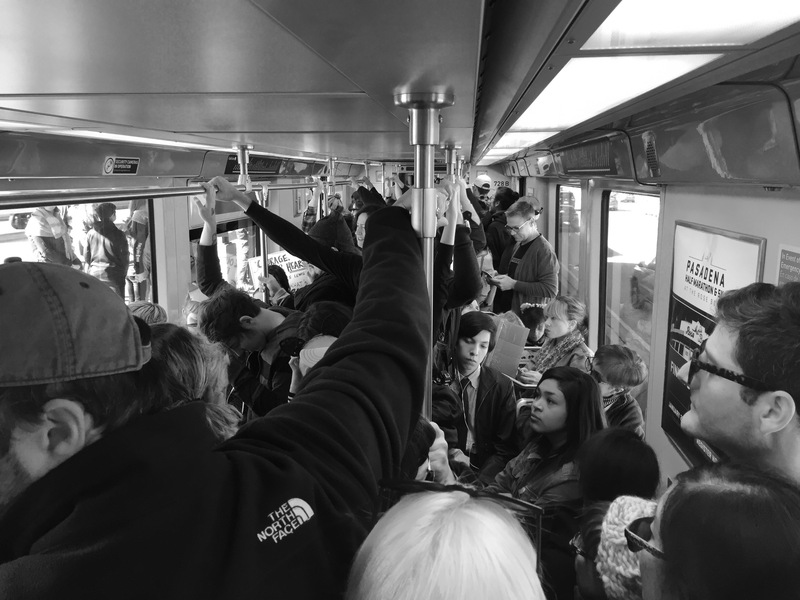 As for us, last Saturday was an exercise in patience for everyone, but Metro staff was helpful, kind, and demonstrated to thousands of first-time riders (myself included) how valuable of an asset they are to our fair city. We’ll be using Metro as much as a Glendale based family can – especially for large events – and will certainly be supporting you from the voting booth! Thank you, Steve, for this entertaining and informative article.